Here’s a special dessert for Valentine’s Day. It’s a special kind of soufflé — a flourless gluten-free cake, actually — that is meant to fall before serving. How much fun is that? It’s similar to a classic soufflé batter but contains a goodly amount of extra butter, which makes it heavier than traditional soufflé formulas. It’s fudgy and chocolaty, somewhat like a pudding, and quite irresistible. You begin to make this chocolate soufflé in the classic way, by beating the yolks and whites separately, adding melted butter and chocolate to the yolks, then folding in the whites carefully to keep as much air in the batter as possible. After carefully spreading the soufflé into the pan you put it into the oven and wait for it to rise—which it will, right to the top of the pan — and then you’ll beam with pleasure — not horror! — when you watch it slowly surrendering its uplifting air as it cools, becoming a mere shell of itself. How perverse is that? 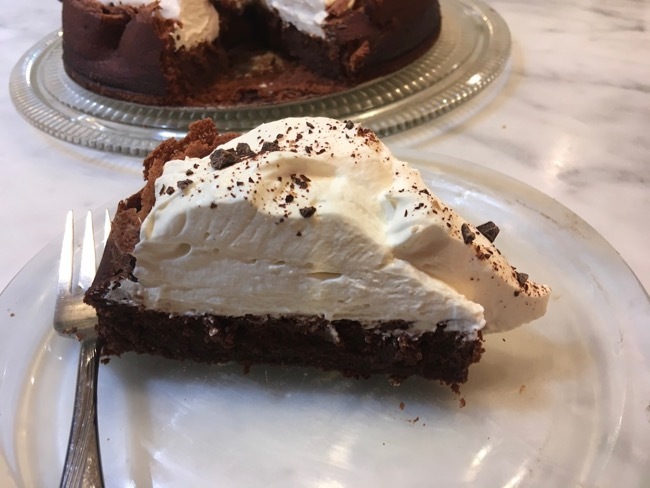 Well, in this case not at all, because I’ve designed this recipe to fall — not fail — so that you can fill the cake’s crater with a voluptuously smooth rich and rummy mascarpone cream. You will have created a perfect dessert for Valentine’s Day or for any festive occasion. Why? Because you can make the soufflé cake a day ahead, whip up the filling and pile it into the cake a few hours before serving, then present this masterpiece to your sweetheart or party guests the moment you want to serve it. How great is that? This make-ahead cake will astonish your eyes and awaken your chocolate-loving taste buds. 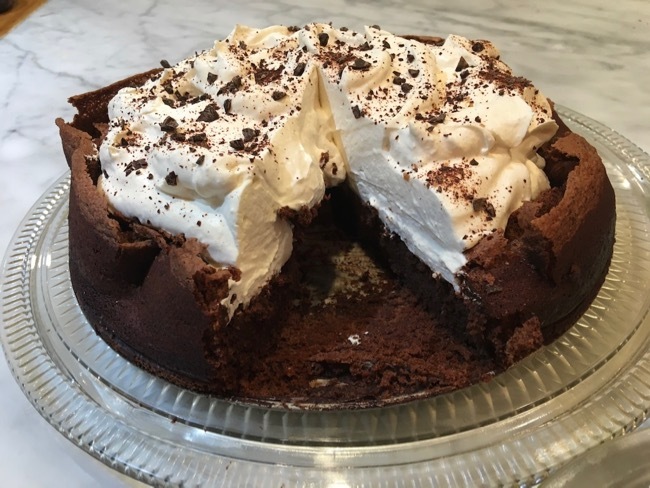 The whipped mascarpone and heavy cream filing holds its shape beautifully when you slice it. You’ll need an 8-inch springform pan. 1. Adjust an oven rack to the center position and preheat the oven to 325 degrees. For the pan, butter an 8-inch springform pan and line the bottom with a circle of parchment or wax paper. Butter the paper and sprinkle in the cocoa powder. Shake the pan around until it’s evenly coated with the cocoa and knock out the excess. 2. For the chocolate soufflé cake: Put the chocolate and butter into a medium size metal bowl and set the bowl into a large skillet with about 1-inch of simmering water. Stir occasionally with a rubber spatula until the chocolate and butter are melted and smooth. Remove the bowl from the water and stir in the vanilla. Set aside to cool to tepid or room temperature. 3. In a medium bowl, start beating the 4 egg yolks and the whole egg on medium speed with a hand-held electric mixer. Gradually add ⅓ cup of the granulated sugar (reserve remaining sugar for the egg whites), beating several seconds between additions. Increase the speed to medium-high and continue beating for 3 to 5 minutes more until the yolks are very thick and pale and creamy. Beat in the salt, and gradually beat in the chocolate on low speed. 4. In a clean bowl with clean beaters, beat the 4 egg whites on medium speed until frothy, about 1 minute. Add the cream of tartar and beat until the whites form soft peaks, peaks that hold a soft shape and that droop slightly at their tips. While beating, gradually add the remaining ⅓ cup sugar about 1 tablespoon at a time, beating a few seconds between additions. Raise the speed to medium-high and continue beating a minute or two until the whites form stiff shiny peaks that droop just a tiny bit at their tips. 5. Stir about one-fourth of the whites into the chocolate and yolks to lighten them, and fold in the remaining whites gently until no whites show. Scrape the batter into the prepared pan and spread level very gently. The pan will be about half full. Put it into the oven. 6. Bake 30 to 35 minutes or a bit longer. During baking the soufflé cake will rise right to the top of the pan. The center of the cake may look underdone. Bake until a wooden skewer inserted into the center of the cake comes out with a little chocolate sticking to it. Remove the cake from the oven and run the tip of a small sharp knife around the side of the cake to release it from the pan. The cake will fall to about half the height of the pan as it cools, and the top will be crusty and cracked in many places. It will look like a disaster. You want this to happen! 7. When the cake is completely cool, remove the side of the pan. Cover the cake with a square of wax paper (to keep any cracked pieces in place) and a wire rack and invert. Remove the pan bottom and paper lining; cover the cake with another rack and invert again. Remove the wax paper. With a large metal spatula, slide the cake onto a cake plate. If not ready to serve, wrap the cake and plate in plastic wrap and let stand overnight at room temperature. You can also refrigerate the cake and serve it cold. 8. For the filling, you can use a stand mixer or a hand-held electric mixer. Put the mascarpone, heavy cream, confectioners’ sugar and rum or vanilla into the large chilled bowl of a stand mixer or other large chilled bowl. Beat on low for about 1 minute to combine all the ingredients, then raise speed to medium-high or high and beat a few minutes until the cream is thick and fluffy and holds a definite shape. 9. To serve, pile the filling into the fallen soufflé cake and sprinkle with the chopped chocolate. Serve immediately or refrigerate for up to 3 hours. Rinse a knife in hot water and shake off excess water before making each cut. Add a few raspberries to each plate if you wish. Serving of fallen chocolate soufflé cake piled high with rum-flavored mascarpone beaten with heavy cream. Your recipes are so clearly and carefully written–mark of a true teacher. Your comment, Julia, gave me shivers of joy. How wonderful to be acknowledged by such a wonderful writer and cookbook author. This is wonderful! A recipe so well written, increasingly rare. And your cake is splendid. Thank you so much, Maria. This means a lot to me coming from you.